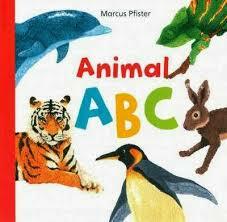 This month, Virtual Book Club for Kids is spotlighting books by Marcus Pfister. Mr. Pfister lives in Switzerland and has written and illustrated almost fifty children’s books over the past thirty years. Though Marcus Pfister is best known for his Rainbow Fish series, he has loads of other enchanting books your children will enjoy. My daughter and I headed to the library and picked out a few gems to read together. She chose books centered on topics we both enjoy: bedtime, the zoo, spring, and alphabet animals. One of Marcus Pfister’s most recent books, Animal ABC is full of bold, colorful illustrations of animals from around the world, coupled with playful rhymes. 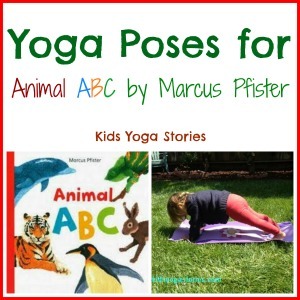 This fun alphabet book is perfect for acting out animal yoga poses for kids. Learning the alphabet through movement makes sense to our little learners. 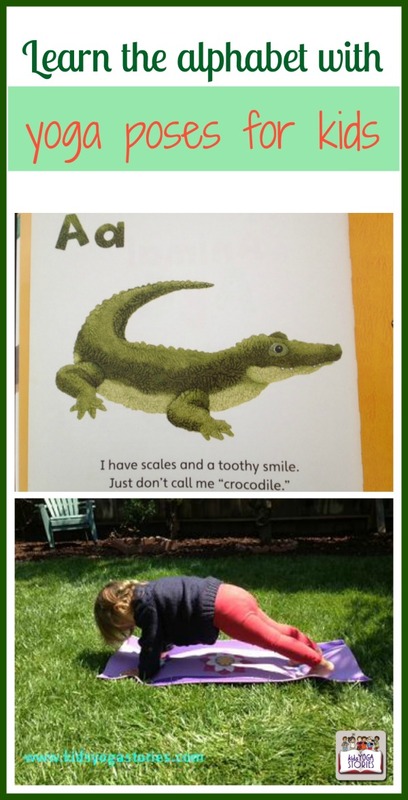 As your children practice the “A” sound, they can point to the alligator picture, you can read the rhyming words, and they can act out the alligator with their bodies. Below are the first six letters along with matching yoga poses. Yoga is best practiced in a clear space while barefoot and wearing comfortable clothing. Don’t worry if the yoga pose doesn’t make sense to you—the point is to have fun learning with movement. Encourage your children to make up their own poses for the animals. How do the animals behave? What sounds do they make? Where do the animals live? Check out the list of Kids Yoga Poses for images of each of these poses. How would you act out the rest of the animals through yoga poses? 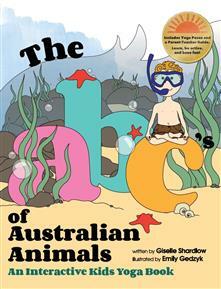 If you enjoyed this alphabet animal yoga experience, you might like The ABC’s of Australian Animals: An Internative Kids Yoga Book . Pretend to be an A for Alligator, B for Bear, and C for Cougar through yoga poses for kids! 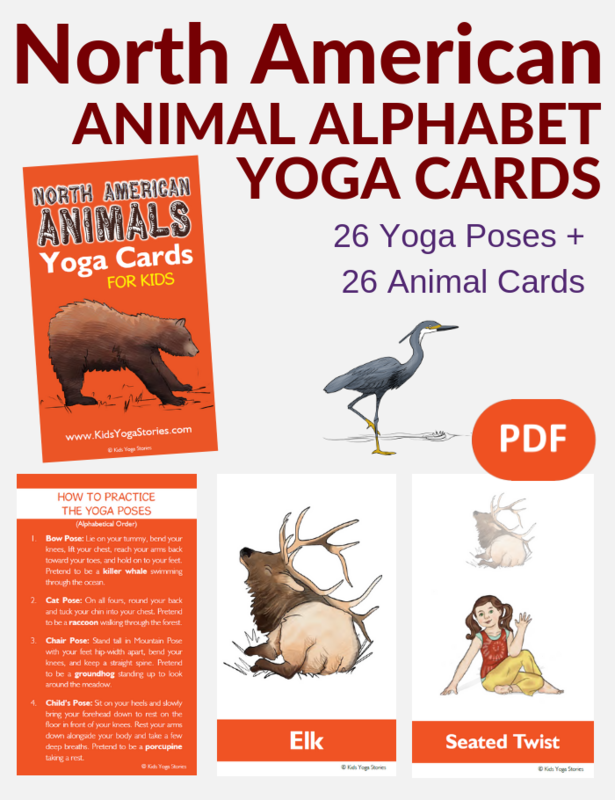 Instantly download these 66 North American animal alphabet yoga cards to learn the alphabet through movement in your home, classroom, or studio. Includes an Alphabet Index Card, Yoga Tips, Pose Instructions, 26 Yoga Pose Cards, and 26 matching North American Animal Cards. The multicultural yoga kids are from seven countries. Download the matching alphabet poster here. Ages 4+. Purchase North American Animals Alphabet Yoga Cards for Kids here. This post was part of this month’s Virtual Book Club for Kids. Join us every month as we explore different authors and offer fun book activities to enjoy the books. 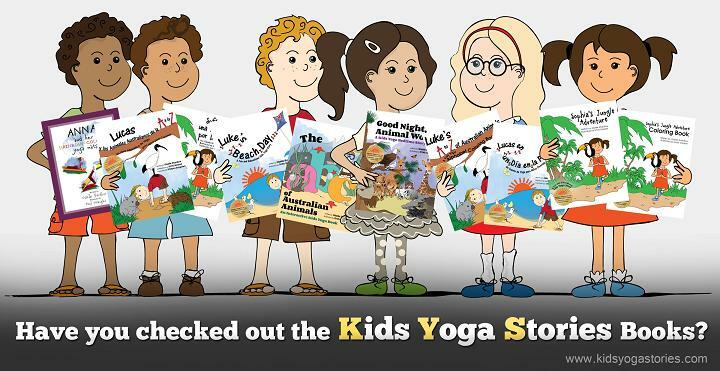 Sign up for our weekly Kids Yoga Stories newsletter to find out when the next post is live by adding your email address to the box at the top of the page. Thank you, Tina! I can’t wait to see your review of the Good Night, Animal World. To join the Virtual Book Club for Kids, reach out to Toddler Approved, Educators’ Spin On It, or Rainy Day Mum. https://www.virtualbookclubforkids.com/ Or send me an email!